As per latest announcement, WBPSC Admit Card 2017-18 has recently released by the West Bengal Public Service Commission. Earlier the organization has circulated the job notification for filling the vacancies in Assistant Manager and Assistant Professor in Chemistry, Physics, English, History, and Economics. Aspirants if you had also applied for the Professor/Manager vacancies, so download your WBPSC hall ticket via online mode to participate in the interview. Candidates who had successfully qualify the written exam and going to participate in the interview round, must download the WBPSC Admit Card by visiting the official website of the Public Service Commission. For the convenience of applicants, we have provided the essential guidelines with the help of which candidates can easily download their call letter. Have a look at the below area of this page for getting additional information about West Bengal Public Service Commission hall ticket. Candidates, qualified West Bengal PSC Exam who are preparing for the interview round must undergo here mentioned guidelines to download the WBPSC Admit Card. Hit the “CALL LETTER OF ASSISTANT PROFESSOR IN DIFFERENT DISCIPLINES for General Degree Colleges in the W.B.E.S. under the Higher Education Deptt., GOVERNMENT OF WEST BENGAL, ADVT. NO.-12/2016” or “CALL LETTER OF ASSISTANT MANAGER UNDER THE DIRECTORATE OF CINCHONA & OTHER MEDICINAL PLANTS, IN THE FOOD PROCESSING INDUSTRIES & HORTICULTURE DEPARTMENT, GOVT. OF WEST BENGAL, ADVT. NO. – 18/2015-(4).” link. This will take you another page, asking some important information as “Candidate’s First Name” and “Date of Birth” etc. Once individual fill all details, candidates should press the ‘Submit’ button. Within the few seconds, your West Bengal Public Service Commission call letter will be opened on your digital screen. For the purpose of interview, individuals should take the print out of the admit card and must keep it safe. West Bengal Public Service Commission has publicized the recruitment notification for filling the positions of Assistant Manager and Assistant Professor in various departments. Aspirants, applied for the PSC Recruitment notification who had also qualified the written exam, must download the Public Service Commission hall ticket. Hit on the link of WBPSC Admit Card for acquiring additional information. 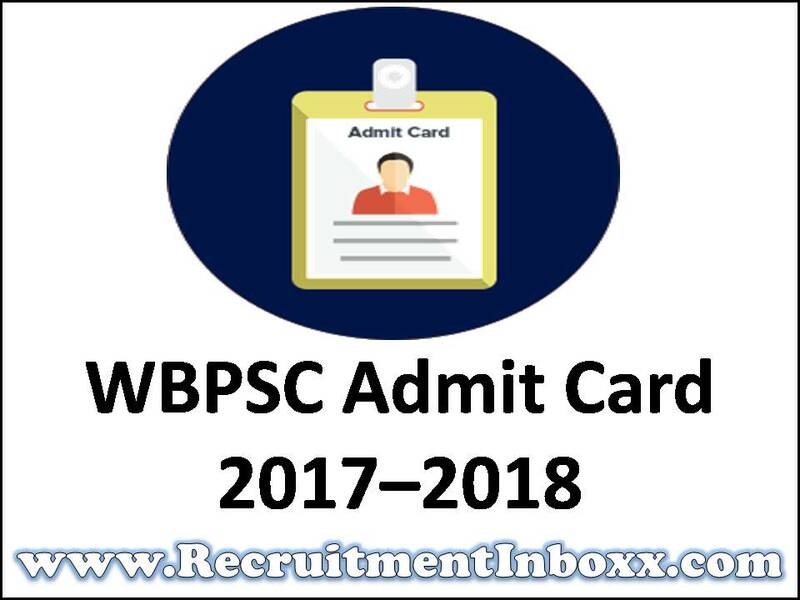 We have presented all important and necessary information related to the WBPSC Admit Card on this page. Candidates are suggested to make us good connection with us for getting latest information, so stay keeps in touch with us.